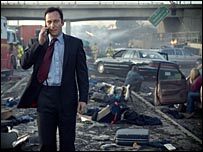 BBC One's six-part drama The State Within follows the UK's ambassador to the US for a fortnight after the bombing of a British airliner. The diplomat - who learns he is being manipulated in a high-level conspiracy - is played by British actor Jason Isaacs, who was Lucius Malfoy in the Harry Potter films. 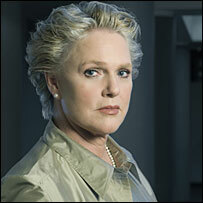 Ex-Cagney and Lacey star Sharon Gless is the US Defence Secretary, trying to balance her country's interests with the demands of the UK and the threat of terrorism. GLESS: It's a conspiracy thriller. ISAACS: It's an old-fashioned pot-boiler and a page-turner if it was a book, but with very contemporary themes and style. It's the kind of show the BBC used to make, but people have been complaining for years that they've stopped making. Somebody had the courage to imagine that the audience had a brain and has read the odd newspaper, and is prepared to work to understand what's going on. GLESS: I've heard it compared to The West Wing, or a combination of The West Wing and 24, and I don't see that at all. This is much bigger than that. This is like really, really huge. ISAACS: It's more sophisticated in terms of its global reach. And sadly The West Wing has been fantasy for years because they have a Democratic president. This is much closer to real events. GLESS: Don't you think it's a Republican regime in this show? ISAACS: Oh yeah. You would move seamlessly between this show and the news. That's how realistic and dramatic it is. How is it different from your previous roles? GLESS: Well, I've never played anyone this old before (raucous laughter from both). I didn't realise until I saw it on the screen. Also, I don't believe I've ever played anyone this powerful. ISAACS: There aren't many people in the world as powerful. GLESS: She's actually more powerful than the president. ISAACS: Her son died in Afghanistan, so she swung the election for the president in the show. She is America's darling, the voice of America, and that gives her a lot of power. GLESS: They don't know what she's like behind closed doors, however. ISAACS: In many ways, [my character] is a classical hero - but he's a flawed hero. It's a very subtle telling of this story and the character being a diplomat is less proactive than a lot of leading men. He has to manipulate other characters, and uses his brain a lot more than his brawn. He uses anything at his disposal. He has to work within these very narrow parameters to represent Britain's best interests. SHARON: You become a victim, really. ISAACS: And in the end, the struggle between doing what's right, doing what serves his ambition and doing what serves the country makes him a very complicated protagonist. It's always fun for an actor to get their teeth into a character who's torn apart by different forces. That's unusual, since leading characters normally just plough through the centre with all guns blazing. How does the storyline compare to your own views on the US? ISAACS: I certainly can put my hand on my heart and say I didn't vote for Bush. 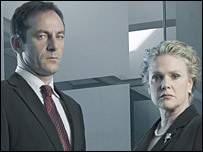 Jason Isaacs and Sharon Gless were talking to BBC News entertainment reporter Kevin Young. The State Within will be shown in the UK on BBC One from 2 November, and on US channel BBC America in mid-February.